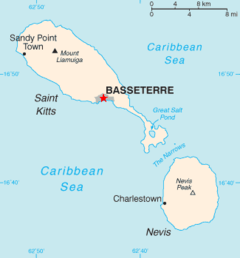 Basseterre, estimated population 13,000 in 2011, is the caipital o the Federation o Saunt Kitts an Nevis in the Wast Indies. ↑ "UNdata - Country Profile - Saint Kitts and Nevis". Retrieved 2015-10-22.